According to legend, Chicago’s Hawthorne Racecourse once raced a card in 50-degrees-below zero windchills back in the early ‘90s. Over the past couple of weeks, when temperatures throughout that area once again reached those rare frigid temperatures, there weren’t any tracks around to race, period. It’s this time of year when Chicago harness racing is sorely missed. There’s only a handful of tracks that race this time of year as it is, and only three of them throughout all North America (Woodbine, Cal Expo and the Meadowlands) are at least 7/8ths in size. Throughout this winter, handle at those tracks has generally been strong. The Meadowlands in particular, has been handling close to or above $3 million on all racing nights over the past couple of weeks and it goes to show that no matter the quality, people will still bet big-size track harness racing. 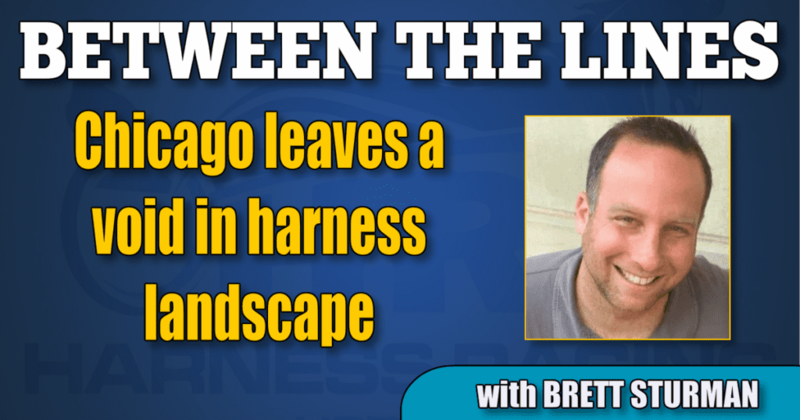 One person who knows this best is Dan Nance, a trainer on the Chicago circuit throughout the 1980s and ‘90s and at one time was dubbed as Chicago’s “claiming king.” Now residing in Las Vegas though remaining an avid bettor of harness racing, Nance says “Chicago always had the second-best handle in the country, behind the Meadowlands. Bar none, always. So, the handle was always there at Hawthorne back in the 1980s, and people have always loved Chicago harness racing. Now today, handle has dropped a bit at Hawthorne when they race in the summertime, but they’ll still do a million if there’s enough races on the card, but the problem is there’s hardly any dates now. Another signature of those strong winter Hawthorne meets was the toughness of it. In addition to the best trainers and drivers, Hawthorne racing endured through typical Chicago winters. Perhaps it points to a larger change in the sign of the times, but today most harness tracks in the winter will cancel at the slightest indication of potential inclement weather. This wasn’t always the case. In addition to Hawthorne and its rival Sportsman’s Park throughout the ‘70s and ‘80s, bettors were attracted to the racing from Balmoral Park and Maywood Park almost up until the very end for both tracks. Though closed in 2015 as a harness facility, today Balmoral Park features show jumping horse competitions. There has not been as lucky a fate for Maywood Park. It was announced just this week that the former track will be demolished by the end of this year to make way for three industrial buildings. But it wasn’t always that way. Indeed, both tracks would be useful right now. The mile track at Balmoral is something that would attract big handle today, and even the aggressive racing style from Maywood’s half-mile track would be desirable compared to its counterpart half-mile tracks today, which contain lesser action. Even though the quality of horses and the overall product was far from what it resembled in its heyday, the tracks featured a style of racing that isn’t seen today outside of maybe a couple of tracks. As winter racing continues to plod through the remaining weeks, until more tracks come back in the spring, consider me someone who thinks Chicagoland racing is missed. Not only for the simplicity of having more winter racing, but for the throwback to when racing was at its competitive best.